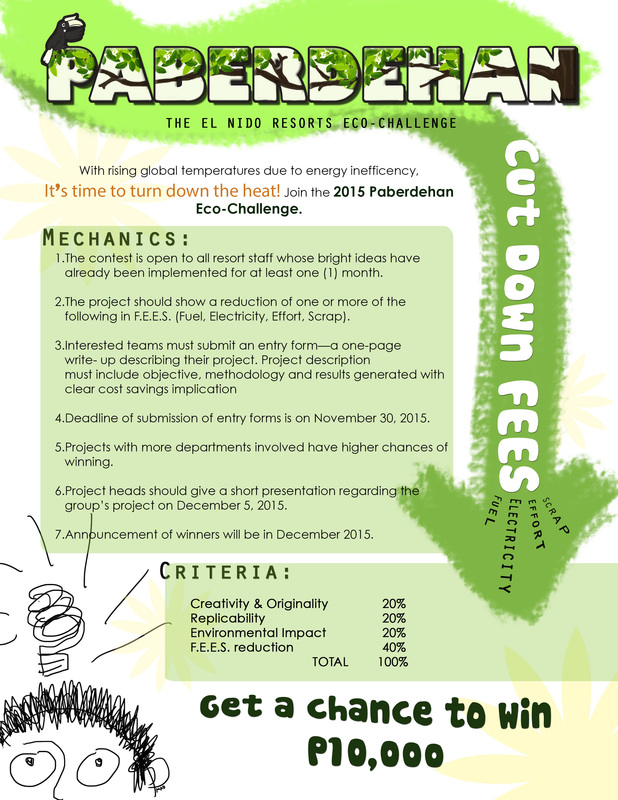 Once again, El Nido Resorts launches the Paberdehan Eco-Challenge but this time, with a twist! In the past, the departments were encouraged to submit project ideas for implementation, which should target the reduction of F.E.E.S. (Fuel, Energy, Effort and Scrap). Each project idea is then given at least a month of implementation after which teams must present their results. For this year however, we will be awarding a project that has already been implemented, and is still being implemented. This is one way of encouraging the departments to regularly come up with environmentally friendly initiatives and to really stick to them. Deadline of submissions is on November 30, 2015. The projects will be appraised by the Management Committee based on Creativity and Originality (20%), Replicability (20%), Environmental Impact (20%) and F.E.E.S. Reducation (40%). The winning entry will be announced on December and the winning team will receive a cash prize of P10,000. Previous Miniloc Island Resort Wins “ENR’s Best in Waste Segregation” Award.